The cats lived a calm and peaceful life in their own kingdom, ruled by a wise and righteous king. But one day a terrible misfortune happened. Evil foxes kidnapped the daughter of the king, the beautiful kitty princess. These four heroes want to save her and need your help on their long and dangerous way in this free online game. Do you like cats? If you do, then you surely will not refuse to help them in this free arcade game! They lived peacefully in their own kingdom, but one day everything changed dramatically. The Cat King's beautiful daughter had been kidnapped by the foxes who had been the cats' enemies for years. 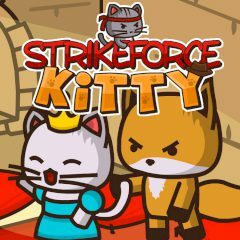 You must control a special team of four brave cat heroes, help them to defeat the fox army and to save the princess. Collect clothes, weapons and bonuses to upgrade your cats. Are you ready for an epic battle in this adventure game?